Many many years ago I read an article written by Mike Burrows which said, to summarise, that if you'd done most things on a bike, and liked to go fast, but never tried racing, then it was worth giving it a go at least once as it's a very amusing thing to do and you'd probably meet some very decent people too. It prompted me to give it a try in 1999 and I found this to be absolutely right. I raced recumbent bikes from then until 2005 with the BHPC in the UK. I'd like to repeat Mike's advice. Try racing. It's fun. In the UK I raced a Speed Ross bike which was nice and light, but competitive for racing only because of the existence of the "Sports Class" for bikes which were usable on roads as well as on a track. I sold the Ross before emigrating so I only have one recumbent now, a rather well worn Pashley PDQ. It's a fine touring bike, but it isn't very fast. Mine is fitted with panniers, baskets and multiple sets of lights as I use it for touring. A couple of weeks ago I was told of an upcoming race in Groningen organised by the NVHPV and the old interest was re-ignited so today I rode the bike the 30 km to Groningen this morning to take part. As expected, there were a bunch of very friendly people at the event and it was a whole lot of fun. My average speed in the 50 minute race was just over 34 km/h, a result which actually surprised me as it is certainly quicker than I used to ride that bike and not far off the speed I used to ride the Ross. However, over here it's different. The winner of the race rode his velomobile at an average of 49.6 km/h. It wasn't a delicate machine unpacked from the back of a van, but was ridden to the event. On Monday it'll be used for his commute. However, in the main race today I was second from last. It got worse in the results from the standing start lap nor the flying start as in both of these events I simply got slower and slower as I'd already used my energy on the first race ! As well as the superior bikes, I think it comes down to something that Eddy Merckx once said to an aspiring cycle racer: "ride your bike, ride your bike, ride your bike". The Dutch do ride their bikes. They do it an awful lot, and they're very quick on them. Today's competitors were fast. The average speed was over 41 km/h instead of a bit over 33 km/h at the last race on a similar circuit that I took part on in the UK. In that event I finished 19th out of all 55 competitors and was first in sports class. Even at today's speed I'd only have slipped a few places. That's quite a difference. I'm seriously outclassed. By the time I got back home I'd covered 112 km. All of it was enjoyable, including the ride home with other competitors from Assen at a speed I could keep up with on a newly constructed super smooth cycle path. I raced on the same track again the next year, with a much faster bike. A couple of months ago, Fernando in London bought a basket and support from me to transport his dog, Fosse. Yesterday, Fernando kindly sent me some photos of the two of them taking part in the London Freewheel ride last week. This was the second year of the Freewheel, and it was wildly successful: 100000 people were attracted to ride their bikes on 12 km of closed roads in the capital. The success of the event shows just how attractive it is to be able to cycle without having to be constantly concerned about motorised vehicles. It's a good demonstration of how increasing subjective safety results in more people cycling, even if the improvement is just for one day. Clearly the pent-up demand to cycle that is present in most places also exists in London. Imagine the rate of cycling that London could achieve every day if the infrastructure in the city was redesigned with emphasis on increasing subjective safety for cyclists so that it was always to the level experienced on the Freewheel. I have more posts referring to subjective safety. Fernando's basket is the extra large size that I make for transporting dogs, and it's mounted on a sturdy front rack. I have another photo of Fernando and Fosse together, accompanied by photos of other people with their dogs on their bikes. We organise holidays over here in the Netherlands where we always have this degree of subjective safety. We would also be very pleased to have the transport planners from wherever you live visit to take part in a Study Tour so that they can see the result of achieving this. I noticed yesterday as I put it away that my town bike had managed to clock up exactly 4001 km on its bike computer. The computer was given to me for Christmas by my children and fitted around the middle of January. January 15th to September 26th is 255 days, so this bike has covered an average of 15.6 km, or just less than 10 miles, each day. I mostly work at home so don't have a commute. Most times I take parcels to the post office I use the Xtracyclee. For longer rides I use the PDQ (or, later on. Mango). So, what does make up this distance ? Dog walking takes about 3 km a day. Two days of 90 km+ when the PDQ broke down in the middle of a tour earlier in the year and I had to swap bikes. Is that it ? No. The PDQ also has a bike computer and has done 2500 km in the same period. It was a surprise to me that all the little daily utility rides added up to more than the "big" rides, but they do. I've no idea how far the Xtracycle has gone, but that does the post office run a couple of times a week and did a 100 km weekend due to visiting a basketmaking exhibition (only 40 km away, but I also had to get between the venue, the campsite, the barbecue etc.). The folding bikes do very little by comparison. So, that's about 7000 km in total so far this year, and I'm in line for 10000 km by the end of the year. I'm looking forward to the next 3000 km ! And what is this bike ? It's an anonymous 1980s British made "all steel" 3 speed equipped bike with proper 26" wheels (26" x 1 3/8 or ETRTO 590 - over an inch bigger in diameter than MTB 26" wheels). It's also still got its original steel mudguards and chainguard, so it's a bike you can ride in any clothes without getting dirty. It's not light, it's not at all flashy, it wasn't expensive when new, but it's very reliable, very comfortable and definitely suitable for everyday use. The bike actually came to me by an unusual route. It was found dumped in a lake north of Cambridge some years ago when walking the dog. It looked a bit of a state, but the only thing that made it unrideable was the state of the tyres and needing a few more spokes in the rear wheel. It's since had a new chain (steel chainrings aren't like alloy ones and last almost forever), another set of new tyres, a proper dynamo light system (what would it have cost me in batteries by now if I used battery lights ? ), new brake blocks, a new brake cable, a black hammerite paint job to replace the nasty red/white that it had from the factory, a new black saddle to match the paint (and to replace a damaged one) and a new front wheel hub when I rebuilt the wheel that last week. Apart from fixing things which had been broken by the person who'd dumped the bike, these are parts that eventually wear out on any bike. A typical use for this bike is a shopping expedition. This is a 1970s anti bike-theft ad from the UK, but I think it has more to say than just a warning to lock your bike. Look at the people in the ad. All ages, both sexes, no special cycling clothing. It is from an age when cycling was a normal activity in the UK, not something for the athletic and not something influenced by an "extreme sport". The video represents the loss of a culture of everyday bike use, which has been replaced by ever increasing car use in the UK. During the 1970s and 1980s, Britain's cycle culture changed. The use of traditional English town bikes decreased sharply, leaving Pashley as the only manufacturer. The Dutch used to make a big deal of using English parts on their quality bicycles. Many English people now think that bikes of the traditional English style are Dutch. During this period, the older utility cyclists nearly disappeared and were replaced in rather smaller numbers by youngsters who ignored the old and imported the mountain bike from sunny California. I've absolutely nothing against mountain biking as a sport. It's not my sport, but I wish all luck to those who do it. However, the bikes are dreadful for utility use. It is now quite difficult to buy an inexpensive bicycle in the UK which is not styled like a mountain bike, even those sold as "hybrid" bikes tend to lack the features needed for utility cycling. Trying to use these things as utility bikes is part of what has driven the British away from cycling. Getting back the European town bikes that the UK used to be full of is a large part of getting back the rate of cycling that other European countries have kept. Britain's cycling rate in the 1950s was higher than that of the Netherlands today. People in the main rode single speed or Sturmey Archer 3 speed hub equipped steel frame bikes fully equipped with mudguards, racks etc. They rode these in hilly areas as well as flat areas. The right tool for the job. If you want advice on wine, you're better off asking someone who appreciates good wine than asking a teatotaller. Similarly, if you want to see what bicycle works for utility use, look to a time or place where utility cycling is common. What you see everyone using on the streets during the rush hour, on the school run, at the shops, at church and in the bike shops is the ideal machine. If you're in any doubt, see the photo on the right, which shows a typical selection of bikes parked in Assen, along with a typical cyclist, in normal clothing. Just like everyone in the video at the top. The Netherlands was for a long time the largest market for the British manufacturers Sturmey Archer and Brooks. They were so popular that cycle paths were named after them. Three years ago I took this photo in Bottisham near Cambridge in the UK. It shows the UK's National Cycle Network route 51 distance from Bottisham to Newmarket as being 15 miles in length (turn left here) while the road route for cars is just 6 miles (turn right). How is anyone going to see cycling as a convenient way of getting anywhere if cycle routes are indirect ? In this case the distance is over double the distance by bike as by car. Cycling needs to be convenient. Dutch planners know that and you tend to see the opposite on sign posts in this country: Shorter routes for cyclists than for drivers. The second set of signs are positioned on the route between Assen and Groningen. From this point, the indicated distances on the cycle routes are shorter than those on the driving routes for three out of the four destinations on the boards, and the same for the fourth destination. Make it safe and make it convenient. That's surely what you do if you want to attract people to cycling. Each week our local paper includes 4 pages or so of information from the local government about what is happening around the city. A "brink" is a green in the middle of a town, and generally where you'll find the town hall. Hence "Berichten van de brink" or "News from the green"
On the left you can see the first page of this week's communication. The main story is about a statue for the city centre. The "Old Beech". However, there's nearly always something for cyclists too, and the item I've zoomed in on is about a cycle path to be built connecting the North of Assen with one of the outlying villages, Zeijen. There is already a very good quality cycle path connecting the city to the village (featured in a video at the end of this blog post), but the new one which opens at the start of next year will provide a different route and be intended more for recreational rides. The path will take the route of an existing right of way called the "Schoolpad" as many years ago it was the route for taken by school children. However, it was never properly surfaced and has been out of use except for agricultural vehicles for many years. I've ridden on it, and at present it's rather bumpy. Similar to many bridleways in the UK. The "restoration" of this path will give it a smooth concrete or tarmac surface and the result will resemble the artist's impression in the article, complete with the lining of oak trees to give a pleasant appearance and provide a habitat for bats. The path will be broad enough that agricultural vehicles can also use it for access to the fields, so it will have a proper foundation and be built to the standard of a road. This two kilometre long high quality path will cost half a million euros to complete. It is far from the only work planned for the rest of this year and next year. Further blog posts will cover others. This path will feature on our cycling tours next year. When I lived in Cambridge I proposed for many years that a route be established between the North of Cambridge behind the regional college to Landbeach, following the line of the ancient Mere Way. This is similar in many ways. It would provide a direct route from a village to the city (in this case from a village which doesn't currently have a good quality cycle route, and directly to an area with education and employment) and it would follow an existing right of way. Landbeach is a bigger village with a population of 825 vs. 680 for Zeijen, so you might think it would have a higher priority. However, sadly there was no will to provide such a route for cyclists, and no funding available. The video below shows part of the existing high quality route between Zeijen and Assen, and which was featured on this year's study tours. See also how this cycle-path is kept clear of snow in the winter. Dutch bicycles are the most expensive in the world. Visiting a bike shop to find out why. Today I visited a bike shop here in Assen. Bike shops in the Netherlands are quite different from those in parts of the world where few people cycle daily. Apart from special shops which stock special types of bikes, bike shops mostly stock practical bikes which can be used for every day journeys. 60% of bicycles sold in the Netherlands are city bikes. These are generally fitted with mudguards, chainguards, luggage racks and dynamo lights and they have a relatively comfortable upright riding position (another post describes all the features of such bikes). There is a tendency for foreigners to view these bikes bikes as an anachronism. However, in reality they are the perfect utility machine. Reliable, long lasting and efficient for getting around on a daily basis. They are perfectly evolved for their purpose, and make a lot more sense for utility purposes than adaptions of other types of bicycles, such as MTBs or road bikes. The Dutch pay a lot for their good quality bikes. The average sale price for a bicycle in the Netherlands is € 603 vs. an average of around $320 (today equivalent to € 220) in the USA. The bike shop in which I took the photos is quite typical. The majority of bikes on sale fit into the practical category which makes up 60% of sales. Children's bikes are 17% of the market. Also well worth the average bike shop stocking. Note that bicycles are definitely not toys for children in this country, and that as the children will also be using their bikes for practical purposes, children's bikes are also fully fitted with mudguards, chainguards, a luggage rack and dynamo lighting. You can see how these bikes continue to be ridden to school in the winter here. Mountain bikes are around 3% of the market and racing bikes are a part of the "other" category which makes up 4% of the market. Most shops stock them, but unless they are specialists they will have a much smaller selection than of the practical bicycles. Because these bikes are only bought by people who wish to race them (or pretend to race them), you only rarely find cheap mountain or road bikes. Normally there are only highly specified sport bikes - with prices to match. Electric bicycles have now grown to 6% of the market. They're generally slick looking and relatively high performance machines with batteries hidden in the main tubes and small motors. Mostly they are ridden by people who are in the later stages of their lives, but they still don't want people to know that they now ride an electric assisted bike. Note that people don't restrict themselves to one bike. There are 1.1 bikes per person in the Netherlands - the only country where bicycles outnumber people. And of course, these bike shops sell everything you need to go along with a lifestyle where bicycles are practical machines. High capacity front and rear racks, stands, baskets, panniers, map holders, baby seats etc. etc. To finish, I've a video that I made of a visit to a Dutch bicycle manufacturer, in this case Azor - a local manufacturer of good quality bikes. Note the effort taken to produce a long lasting and useful product. The steaming brine bath used to screen components for durability is a part of making a machine which will be reliable for every day use right through the year, and which will still be usable 20 years after it was made. After all, that's what these bicycles are for: Daily use by everyone. Back in the UK, much is being made of the proposed eco-towns. These are supposed to be developments which encourage living in a more sustainable manner. However, none of them seem to be seriously tackling the problems of transport by making a serious effort to get people out of motor vehicles. The Dutch have tackled this by encouraging people to cycle. Houten is a few kilometres South East of Utrecht. It dates back hundreds of years, however it was always a small town until the 1960s when it was targeted for growth. In the 1970s, the city's planners decided to discourage car use and encourage the use of bicycles. The city has grown rapidly since then, allowing a lot of new ideas to be built in at the point of design. It now has 47000 residents living with a very low road casualty rate and a very high cycling rate. To quote from the Houten local government website: "There are 16 districts, each is only accessible to cars via a peripheral road encircling the town. A network of different types of paths for cyclists and pedestrians has been created throughout the area, with a direct backbone thoroughfare to the town centre. Only in residential streets cars are mixed with cyclists. Mostly all schools and important buildings are located along the cyclist's backbone." We visited Houten on the 2006 Study Tour and found it a pleasure to cycle there. The local government web page has English language information about Houten, including links to other articles about the city. While other countries have been slow to pick up on what has been achieved, many of the principles established in the design of Houten have since been used in other new developments and existing cities around the Netherlands. This includes Assen where we base our Study Tours, where the new suburb of Kloosterveen has a strong resemblance to other modern Dutch developments (VINEX wijken) which are influenced by Houten. Note, though, that Houten itself now find itself in some respects a little outdated. Many things were done first in the city, and these ideas have been adapted as they were adopted elsewhere. For instance, bicycle roads in Houten can be used by motorists as through routes. This is not the case of examples elsewhere. Cycling is far more pleasant without cars and the incidence of bullying by motorists is reduced as a result of keeping motor vehicles away from cycling routes. Helen and Les Faber from Canada came to visit today (read their blog: Cyclemania). They've been riding around the Netherlands seeing different parts of the country. I met the two of them at Noordlaren, just out of Drenthe in the province of Groningen, and together we rode south, through heath and forest, past ancient hunebedden and modern radio-telescopes eventually getting to Assen in time to catch a train to Utrecht. The photos show Helen and Les riding on a country road just south of Assen and through some heath a little North. There are many small corners of the country that you don't so easily find without a local guide, as cycle route signs tend to send you on the more practical and direct routes. There was too much to see in such a short time, so we covered as much ground as we could. I had a great time today and I hope Helen and Les did too. Drenthe has a very varied landscape and really is a beautiful province. That's why we chose it as our home. It is not known as the "cycling province" of the Netherlands for nothing and many Dutch people come here for their cycling holidays. We organise cycling holidays here for English speaking people and we also have a slideshow of photos of Drenthe. You can also read Des Faber's account of the day. A few days ago I went on a ride through the countryside checking out a small addition to one of our holiday routes. I rode my long-suffering Pashley PDQ recumbent. The music accompanying the video is expertly played by my friend Terry Clark. You can watch him play this piece on his blog. 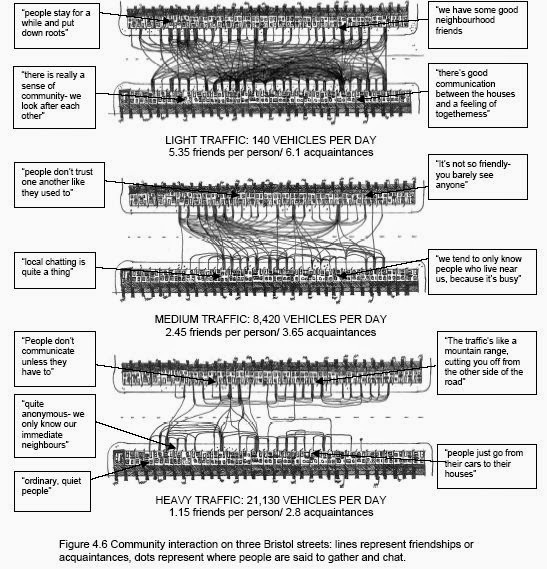 This says that "people who live with high levels of motor traffic are far more likely to be socially disconnected and even ill than people who live in quiet, clean streets." I suggest reading Joshua's own blog entry, or the report itself published on the living streets website. Residential streets in the Netherlands are rarely through streets for motor traffic. As a result, they are usually quiet enough for children to play. Where busy roads come close to residential streets, the noise of motor traffic can be reduced in many ways. Quieter road surfaces can be used, speed limits can be lowered, and of course you can reduce the amount of driving by increasing the amount of cycling. This requires that cycling is made sufficiently pleasant as a manner to make journeys so that people will opt for it themselves. People on busy streets elsewhere who "largely lived in the back rooms of their houses and chose dark or black curtains to conceal the soot build-up from vehicles" are living on streets which are also hostile to cyclists, leading to a spiral of lowering life quality. There are busy roads in the Netherlands too, but they rarely go right past people's front doors. These three photos show a busy road in Assen and the barrier which separates it from where people live. The houses are behind a layer of trees as well as a noise barrier. So, walking from the houses through the barrier you will successively see these three scenes. First there are trees to hide the barrier from the homes. The barrier itself is around 4 metres high and consists of tinted toughened glass at an angle to reflect sound upwards. The road behind the barrier has a 70 km/h (43 mph) speed limit despite being a dual carriageway. It also uses a quiet road surface. Cyclists and pedestrians have other routes so that they do not have to share this road, nor be inconvenienced by having to stop at the traffic lights. The result of this is that the motor vehicles on the road are inaudible inside the homes on the other side of the barriers, and extremely quiet even in the gardens of those homes. People live in houses here with exactly the sort of social interaction described for "Light street" in the paper. There is also another view of the same barriers, including video and a later blog post illustrates how the original main road in this location has been civilized for cycling. If children are to cycle to school, there had better be enough space to park their bikes. These photos (please do click on them for bigger versions as you can't see the bikes properly otherwise) show the cycle parking at one of the secondary schools in Assen. There are a thousand students at this school, and here are their bikes. Very few children go to school by any other means, even though secondary school students travel from as far as 20 km (12 miles) away to get to school. Of course, first of all they have to get there. Without the infrastructure on the streets, this cycle park might well be empty because the students wouldn't be cycling. To see the infrastructure in action see my blog a few days ago which included a video of primary school children cycling, or the slightly older one showing the rush hour. Infrastructure should increase subjective as well as actual safety. That is what makes the students want to cycle in the numbers seen here, and what makes their parents allow them to do so. There is a photo of a different secondary school's parking on the photos page, and you can also see a video showing a route to a school. There are no school buses in this country. There are companies which have a few of the traditional yellow school bus as used in the US, but they hire them out for corporate events, weddings etc. and do not use them to take children to school. Children here predominantly cycle. We were told by a local secondary school teacher than the cycling rate to his school is 100% in the summer, dropping to around 95% in the winter. Some children cycle daily round trips of up to 40 km ( 25 miles ) in order to get to school. and back home. Children attending primary school also cycle. This video, which I took a few months back when it was -2 C ( 28 F ) shows a normal school run at a primary school. It could have been taken on any day. At this location, two thirds of all primary (elementary) school children arrive at school by bike. This is the result of having infrastructure and a social environment which feels safe enough that people let their children ride bikes to school. But wait, what's this article on the right ? The headline reads "Amsterdam first years not happy cycling". It discusses how in Amsterdam the cycling rate for children in the first year of secondary school has dropped such that just 53% of children in the first year of secondary education cycle to school every day, vs. 89% of children over the entire country. The reason most given not to cycle is the heavy traffic and the risks due to it. The article also goes on to say that of those who cycle daily, 43% have fallen from their bikes at some point - mostly by crashing into other cyclists. The low quality of cycling infrastructure in some parts of Amsterdam is part of the reason why. Why include this piece ? It's the same story as above. A high degree of subjective safety is vital if you want people to ride bikes. Amsterdam appears to many foreigners to be a paradise for cycling, and it has the highest cycling rate of any capital city in the western world. However Amsterdam is not a leader within the Netherlands. The city doesn't have the lowest rate of cycling in the Netherlands, but it most surely doesn't have the highest either. For all its charm (Amsterdam is really a marvelous city for many reasons), conditions for cycling in Amsterdam are not so good as in many of the other cities in this country, and that is reflected in a cycling rate which is lower than it otherwise might be. also choose the British double decker or Indonesian Bedford. In the Netherlands, having only just over half of all children in the first year of secondary school cycling each day is something that is recognized as a problem. It's something to work on and improve. Note that it can be expected that by the second year of secondary school, rather a higher percentage of the children will be cycling. And in the UK ?Instead of looking over the North Sea and taking note, the UK is as ever looking for advice in the opposite direction - across the Atlantic. There is a move with the Yellow School Bus Commission to introduce American style yellow school buses to the UK. This commission is ignoring the factors which make people continue to feel that their children are unsafe on the streets and if successful it will further reduce the opportunity for British kids to get exercise. It will also, of course, cost a fortune. Instead of spending on infrastructure which enables a truly green form of transport, the government will end up buying diesel to power buses and produce fumes on the streets. Should I be surprised that this commission was established and is sponsored by a bus company ? Is this proposal for the benefit of the children or of bus company shareholders ? Children with disabilities can't always cycle to school and for them an alternative is provided. To minimise the number of private cars used on the school run, mini-buses are provided which call to each home to pick the child up in the morning and which return again after school. However these minibuses are not available to children who can make their own way to and from school. The American school bus photo at the top is a public domain image which can be found here. The article is from the ANWB*Auto paper published on the 11th of September. Most of the shops open only in the afternoons on Monday. As a result, shopping trips on Monday mornings are somewhat limited and most people shop at other times. However, I needed some things from the supermarket so I went anyway. Supermarkets in the Netherlands are always in the towns and cities, and always convenient for walking and cycling. They are not built outside cities so that they encourage people to drive to them. As you see, it's possible to park your bike very close to the front door of the supermarket even if it's within a covered shopping centre. The video shows the same location a few months ago. The car park isn't expensive to use, but it's certainly less convenient than this. I also made a video of a complete shopping trip which includes this shopping centre. Sunday morning. The bells are ringing, and people are going to church. I'm not a church-goer, but I do like to go for a bike ride on Sunday mornings. Today I cycled past a nearby church to see how the congregation got there and I took this photo. By this church there were three cars and the bikes shown in the photo. I didn't try to count the bikes. The photo at the top of this blog post was also used on the Church Times blog. Today is the cultural quarter festival. The photo on the left shows one of the stages being set up. In the foreground you can see bikes parked already, and the yellow temporary sign showing the direction to the overflow cycle parking expected to be needed later on. The second photo shows what met us as we approached the city centre. The road is blocked for cars, access closer to the city centre is allowed only on foot or by bike for the duration of the event. The third photo shows the overflow cycle parking. It's on an area usually used for taxis and buses. Note that captions on the video are only visible on computers, not on mobile devices. This is a short video showing part of the rush hour traffic near our home in the suburbs of Assen. It's like this every morning and evening. In fact, as this video is rather murky and doesn't have the 360 degree vision you need to see what is really going on in all directions at once, real life is somewhat more impressive than what you see here. This is just one small area. There are many other busy cycling routes. The large bridge, carrying the dual carriageway over the cycle paths, was built in order to make cyclists feel safe and so that they have direct and fast journeys. Until last year, there was a flat road junction here, and the bicycle roads were part of a direct driving route to the centre of the city. No longer. Drivers are now sent along that dual carriageway, through a few sets of traffic lights and by a detour to the centre. The direct route is for bikes. Other, later blog posts explain a lot more about what is happens in this location and why. It's legal here to walk a dog while cycling. It's great for the dog too, as they get to go a little faster than a human's walking pace, which is like a snail's pace for a large dog. Most of all, though, it's pleasant for people as they feel happy enough to do it. The law seems to think that more than one dog would be difficult to control while cycling. Only one dog at a time is legal. However, I've seen people ride right through the very centre of cities here with two dogs on leads. It's not just dogs that get to have this fun. The photo on the right shows someone leading a horse. There's a different attitude to safety on bikes here, brought about by a much higher level of safety for cyclists than in most parts of the world. Both of these photos were taken on the cycle paths which are a large part of the reason for the very high subjective and actual safety. A later blog post includes a video of walking harry by bike. The first photo is of me with our dog, Harry. He also appears on youtube. Another way to transport a dog is in a bike basket. I also have a later post including a video of cycling with Harry. The photo on the left is of a billboard sign in the Netherlands which reads "Boris still has much to learn". This is an advertisement for people to adopt a puppy as a way of donating towards training for guide dogs for the blind. In time, this Boris will learn to help vulnerable members of society. However, there's another Boris who also seems to have much to learn so far as transport policy in London for the vulnerable is concerned. I read this morning that London is not to have a hierarchy of transport users but to just let everyone decide what to do. It's a recipe for chaos. Cities have been civilized in The Netherlands by design, not just by letting people do what they want. What people think they want depends on the conditions they live in. By not changing those conditions, people will continue to want the same things, continue to behave in the same way. There is already a good example of this principle in London: London has a much higher percentage of people using public transport than most of the UK because public transport works better in London than in most places. Changing the environment within which people live to make public transport a more useful option increased the number of people who took that option. Cycling has recently grown a little in London but this happened in large part for less positive reasons (terrorism, recession, cost of other means of transport for people on low incomes). The level of cycling in London now only looks good now in comparison with how it was earlier in London. London is still well behind other European cities, and particularly behind Dutch cities, because cycling in London still only has a positive appeal to the small percentage of people who are relatively easy to attract to cycling. Even they are under pressure, as you can see by observing the amount of safety gear worn. If it is to become a real cycling city, there must be changes in infrastructure that make cycling appeal to all. Once you have that mass appeal cycling will flourish because people want to do it, not because they are priced out of cars through the congestion charge or scared from public transport due to terrorism. This was the first post on this blog about Boris Johnson. There are now many more. Everyone cycles here. Yes, everyone. OK, so I have to admit that's a very slight exaggeration as there is a small minority who genuinely don't, but it's really a very small minority. Officially, 93% of the country's population cycle regularly (every week), and just 7% cycle "rarely or never." I've only met one Dutchman so far who said he never cycles, and he was a fake - he continued on to tell stories about cycle trips he'd taken a couple of years previously. Let's take our street as an example. We've got neighbours in their 80s who cycle, both for fun on the weekend and to go shopping or to visit friends. The stats for the whole country show that even the over 65s cycle for 24% of their journeys, so perhaps this should be expected. However, we also have very young children in the street, some born just over a year ago, and when they're not riding around the street on tricycles or in the trailer pulled by a big brother or sister, they are seen travelling by bike too. Even the youngest children travel by bicycle - you can buy child-seats for tiny babies in this country, as you can see on the left. It's recommended for four months and up, but I've heard rumours they're also used for newborns. has a sturdy centre stand and an anti-flop steering damper. There are also special bicycles sold factory fitted for carrying two children together with shopping and which have a special attachment at the back for carrying a buggy. Neither these nor the baby seats are rare devices in the Netherlands. Some people in the middle of their careers end up working a long distance from home and find it hard to make all their commuting journeys by bike, but everyone here cycles at least some of the time, and a large percentage of them do so daily. Virtually all primary school age children arrive at school by bike - they need to as the schools arrange trips by bike too. In primary school, children travel independently from an average age of about 8 and a half. Secondary school children cycle up to 20 km each way, most of them continuing even in winter (we were told on a Study Tour that the rate of cycling to a local secondary school drops from 100% of children to 95% in the depths of winter). Most customers at shops arrive there by bike. Again, this also continues right through winter. I've never before lived somewhere where people cycled in anything like the numbers they do here. In Assen the average number of bicycle trips per day per person is around 1.2 (It's 0.8 for the Netherlands as a whole - still very high compared with most countries), which explains why it always looks like everyone seems to be riding their bikes. The environment for cycling here is such that everyone wants to take part. That's how it should be, and how it has been made. It's not happened by accident, but by policy, and the changes over the years have been dramatic. Dutch planners plan for cycling. The child seat support shown in the photo is available from Dutch Bike Bits. It is manufactured by Steco, who make a large range of items including very popular front luggage racks.